The PePWave Surf series of Wi-Fi modems is an ideal solution to flexibly extend Citywide Wi-Fi to indoor areas. Integrated Home Wi-Fi Access Point. With the new Integrated Home AP feature, the PePWave Surf AP can connect to the Citywide mesh network while also wirelessly serving an indoor wireless LAN consisting of multiple 802.11b/g devices. Always-ON Home AP. Being unique in the industry, the Integrated Home AP is Always-ON even if there is no connection to the mesh network. Latest Surf AP firmware required. High Power and Receive Sensitivity. Each PePWave Surf model is equipped with a high-power radio unit and a 5dBi antenna that provide sufficient transmit power and receive sensitivity to facilitate enhanced Citywide Wi-Fi signal penetration. Fewer Home Devices. PePWave Surf AP can fully replace a separate traditional home Access Point device because its Integrated Home Wi-Fi Access Point feature is always-on and working independent to the status of the citywide Wi-Fi. Dynamic Power Control. 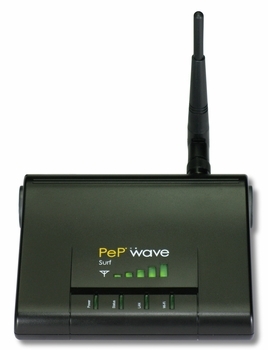 Its unique dynamic power control capability allows PePWave Surf AP to use high power when communicating with the metro-scale mesh network, and retain a lower power setting for indoor home devices – thus maximizing radio efficiency and network performance.